The quest for the 'Gold Standard' of chileverde is a long and tasty journey. 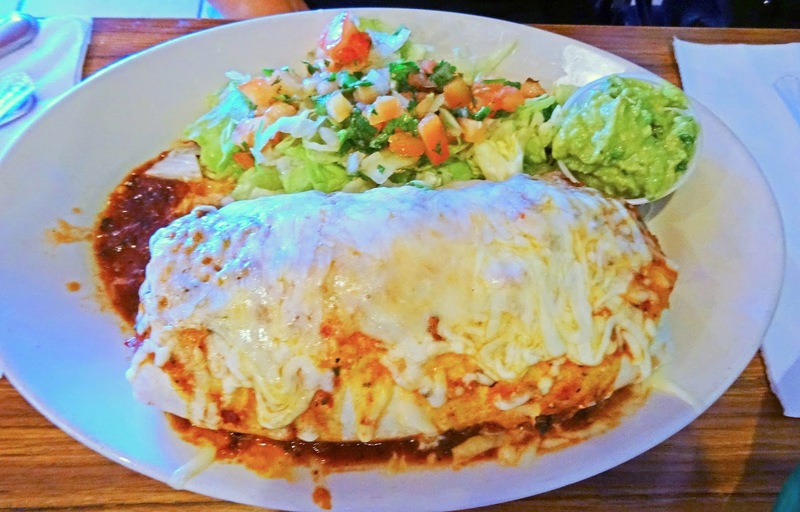 Living in the Bay Area we have numerous choices of Mexican restaurants to dine at. 'La Selva Taqueria' plans to set up a food booth at the local Richmond Farmers Market. One of my duties as manager is to see if this restaurant will be a good fit for our market. It is a tough job, but somebody has to do it. Ms. Goofy and I will be dining at this new (to us) tacqeria. Spoiler-Alert: There is no chileverde on the menu. 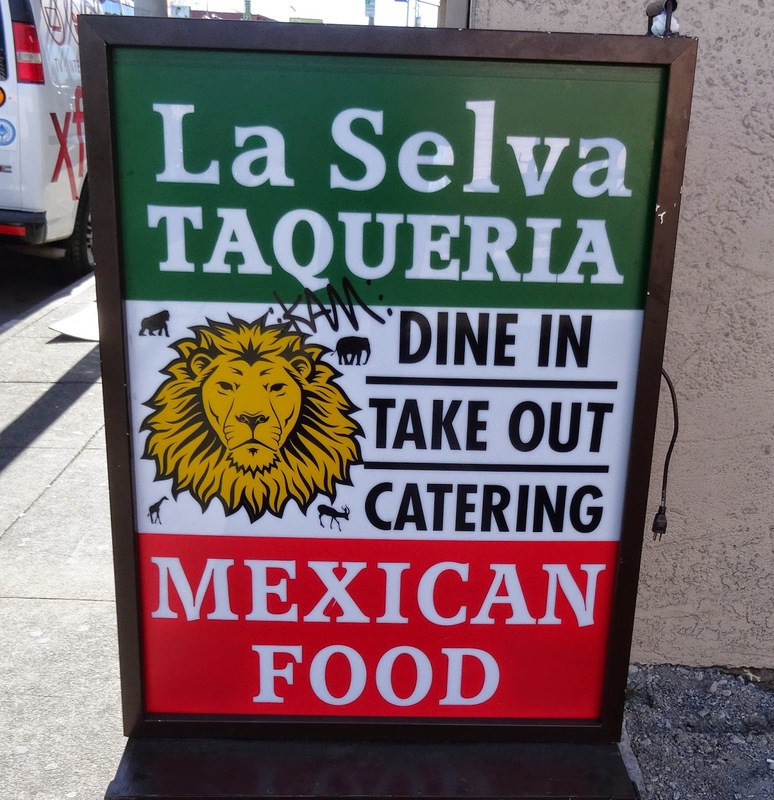 La Selva Tacqueria is located on 23rd Avenue in Richmond California. 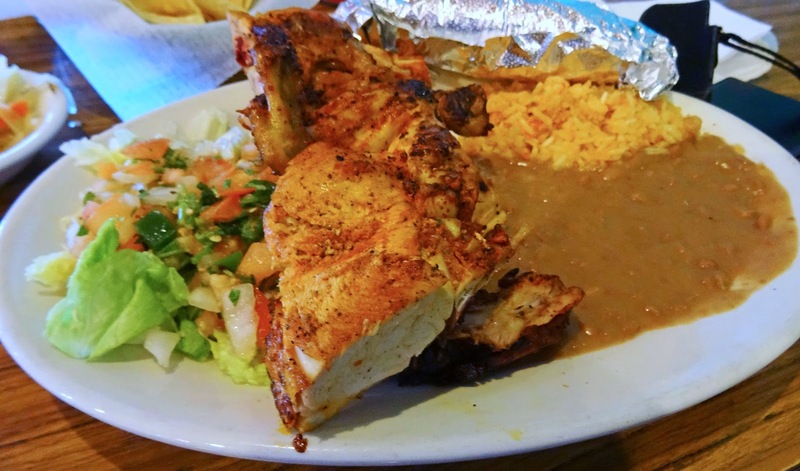 This neighborhood has many Mexican restaurants to choose from. It also is located in a neighborhood that has a reputation of being, how can I delicately put this, but rough. I have driven by this place numerous times and never have stopped. The front is very plain except for the signboard out front. We find a parking spot right across the street. Has my parking Karma returned? A still warm bbq griddle is situated on the side patio. We walk through the door to a beautifully muralled establishment. Somebody has spent a lot of effort and time to paint colorful scenes on the wall. You proceed past a well stocked salsa bar to the counter and place your order. I believe the specialties of the house are from the grill. I order a half chicken and Ms. Goofy a carne asado burrito. Let's start out with the salsa bar. This salsa bar was spectacular. The ingredients were fresh and vibrant. It was a lot of fun trying the different varieties with the complimentary chips. There were all levels of heat, pickled vegetables and even a Cole slaw to accompany papusas. Our entrees were brought to our table faster than you can say 'Holy Guacamole"
The size and volume of our food was humongous. The plates looked fantastic, like a painting with all the sides of salad, rice and beans. My chicken was moist with flavor from the grill. Warm corn tortillas filled with chicken, with a dabs of the many offerings of salsa made for a most satisfying taste treat. Ms. Goofy needed both paws to lift her plate of grilled beef filled burrito. She was very happy with her choice. She also took half of it home for further noshing. 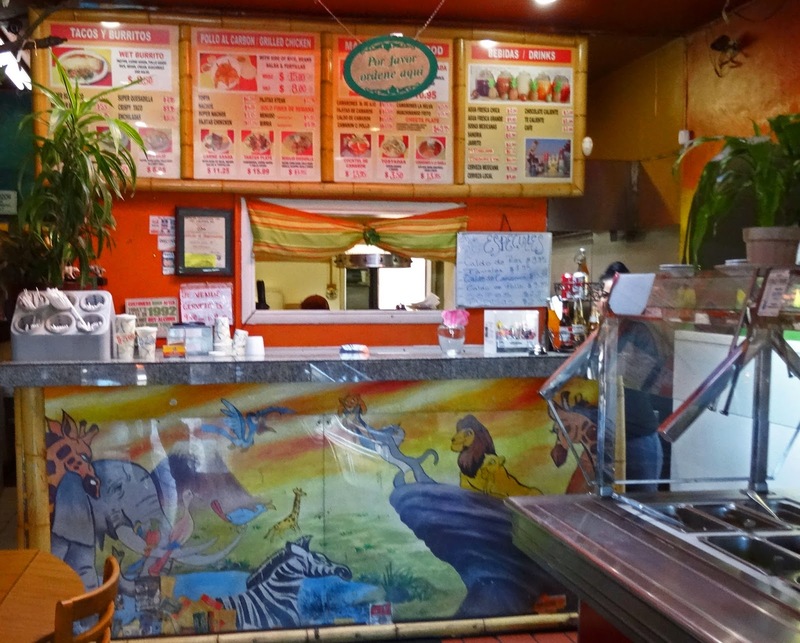 La Selva Taqueria is a fantastic Mexican food find from Richmond California. Great tasting food with ultra reasonable prices. Come hungry or be prepared to bring a lot home. 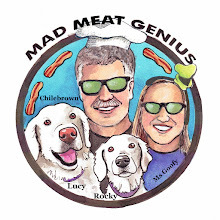 We hope they will be vending in the near future at the Richmond Farmers Market. Goodbye for now because I need to take a nap. Looks like great value and great food. A new taqueria has just opened in the new trendy part of town. 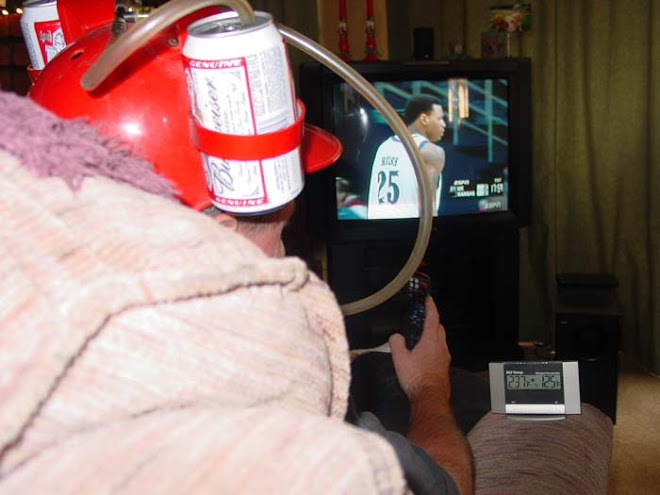 You have inspired me to put on my hipster disguise and give it a try. Three Dogs BBQ, A disguise huh? You should see the wardrobe of the greatwhite hunter. If you Google image 'hipster' you might get a glimpse of him riding his new fancy bike with the back-up camera. no-foam mocha leche latte brews? Those are indeed some humongous plates of food. The salsa bar sounds like a great idea and is not something I've seen around these parts. Big Dude, Salsa that is offered usually can be an indicator of the food to come. 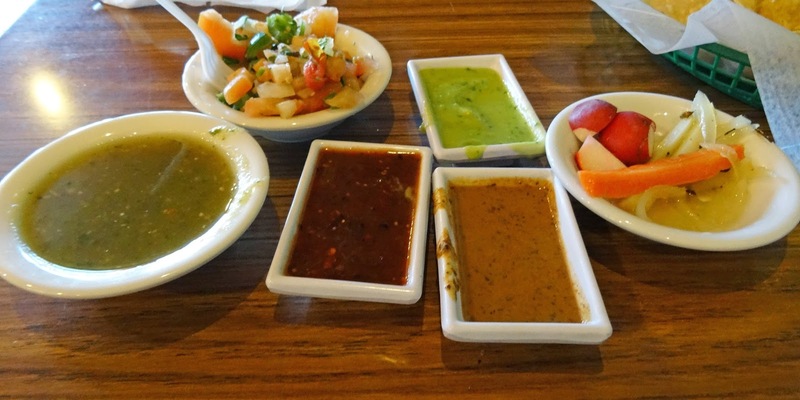 If a restaurant takes the time to make a solid quality salsa they usually do the same with the rest of the food. This salsa bar was spectacular. I am looking forward to our return trip. good golly that is a lot of food! Greg, Ms. Goofy took half home. It was a lot even for me but I cleaned my plate. Good stuff.